CM Dance in Action – videos! We are so proud of all of our students! No matter what level–beginner bronze social dancer or Gold level top competitor. We all have fun on this journey together…laughing, learning, discovering what our bodies and minds are capable of. If you’ve never tried ballroom dancing, join us and our students for a few private or group lessons to experience a whole new world. You won’t regret it, we promise! Chad and Marie go the extra mile for their dance students, ensuring their students’ dance goals are met, whether for social dance or competition. Both are great dancers and are very personable. Had a great time learning ballroom, latin, and club dances from them. Though they are no longer in Sacramento, they are well thought of and greatly missed. Chad and Marie Burson are wonderful dance teachers. I highly recommend them! I have taken dance lessons from them for 5 years, and they have demonstrated endless patience and committment. They work very hard to find the best way for their students to learn correct form and technique, and make progress in their dance skills. They are knowledgeable and professional, and they are very good with beginners as well with advanced competition dancers. Besides being excellent teachers, Chad and Marie are absolutely beautiful dancers. I am so glad I have had the opportunity of dancing, learning, and going to competitions with them. I have truly enjoyed every moment. I’ve been taking group lessons with Marie and Chad both and private lessons with Marie for about 2 years. All I can say is that I am very lucky to have them in my life. First of all, I am a dancer myself (Chinese folk dance, Argentina Tango), I am picky. To me a good dance instructor is someone a very good and graceful dancer himself\herself and knows about people knows how to teach different students differently. Believe me, it is easy to say but not easy to find. Fortunately, when I had first lesson with Marie and Chad I knew immediately I found what I was looking for. They are both fabulous dancers with nice elegant and warm pleasant presentation. Chad is very good at “dance lecture”; I enjoyed learning lots of dance knowledge such as the origin of each dance from him and it helped me to understand the different technique of each dance. Marie is very good at people, she is very intuitive and observant, she knows exactly where you are what you need and what you are missing and she will nourish you in the pace that your body can absolve the change comfortably and make improvements every minute you spent with her. Plus, both they are wonderful parents who have a beautiful family; you can feel the strong positive loving energy floating around just by standing next to them. If you are looking for ballroom dance instructor and you are lucky in the area you gotta make an appointment for yourself today and you will know what I am talking about. Marie and Chad are excellent dance teachers, the best we’ve ever had. Whether in Standard or Latin. If you get frustrated while practicing, watch Marie and Chad dance together and you get re-energized. In addition to being great in what they do, they are a joy to be with and make dancing a lot of fun! I have taken private lessons on Quickstep with Marie for the past couple of years. I’ve been dancing for over 20 years and have competed in the Country Western and West Coast Swing circuits, having had many, many lessons with professional instructors in CW, Swing and Ballroom. I give a top rating to Marie for her professional abilities and knowledge but I want to single out the two things that she has that most other top level pros don’t; her ability to actually TEACH the subtleties and nuances of the dance and her ability to make it FUN. I’ve taken Chad and Marie’s group classes as well and the same as above applies: teaching ability and making it fun. They both have those abilities and the credentials to back it all up. I can highly recommend taking classes from either and/or both. 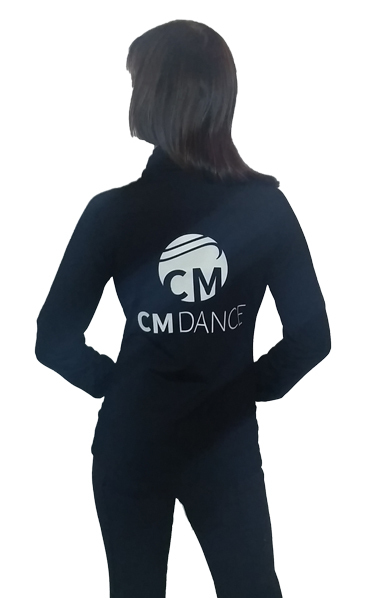 Order your CM Dance Warm-up Jackets! © 2016 CM Dance. All rights reserved.